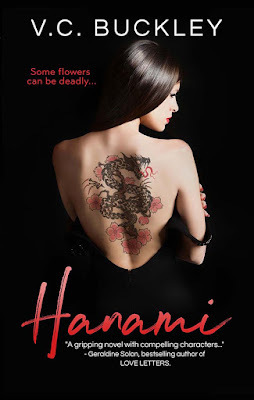 Fabulous and Brunette: Hanami by V.C. Buckley - Book Tour - Book Trailer - Guest Post - Giveaway - Enter Daily! Hanami by V.C. Buckley - Book Tour - Book Trailer - Guest Post - Giveaway - Enter Daily! Hi lovelies! It gives me great pleasure today to host V.C. Buckley and her new book, “Hanami”! For other stops on her Goddess Fish Promotions Book Tour, please click on the banner above or any of the images in this post. Be sure to make it to the end of this post to enter to win a $10 Amazon or Barnes and Noble Gift Card!! Also, come back daily to interact with V.C. and to increase your chances of winning! 1.) Because it’s a unique love story that hasn’t been told this way before. -I’m sure you’ve heard the typical story of the arrogant heartthrob falling in love with the beautiful new student the moment their eyes met that first day of school. But this time, imagine that gorgeous new student was really a secret mob boss to a notorious crime family, and that arrogant heartthrob who is used to getting what he wants has no idea just how dangerous the new object of his attention is. 2.) Because Kenjin Kiyohara is HOT, with a capital H.
…and he knows it…everybody knows it. How can he not when he has his own little mob of trailing fan-girls awaiting his arrival in school everyday. But because of this, Kenjin Kiyohara expects all women to swoon when they see him. It happens often enough for him to safely expect so…until that first day of school, when he met the new girl for the first time. She didn’t seem to know who he was. And not only that… she looked like she wanted to kill him! 3.) Because Sakura Shintani is a Badass, and you need to meet her! -Being the sole heir to the Dragon Clan isn’t the only thing that makes Sakura a certified badass. She is highly skilled in weaponry and empty-hand combat. And not only does she have an angelic face, she has the brains to go with it too. 4.) Because you have to know what happens in the end. - That moment Kenjin and Sakura met is nothing compared to when Kenjin finally finds out what Sakura really was. Imagine discovering that the girl you’ve tried so hard to impress was part of a gang? And not just any gang, but one of the most notorious bloodthirsty gangs in the nation! And oh, did I mention she was the next Boss? 5.) Because it will make you want to fall in love. “How can I possibly be with anyone else after knowing you?…No one will ever be good enough!” –This was Kenjin’s infamous line to Sakura. Now imagine you were Sakura instead and someone said this to you… how will you respond? Take a guess at how Sakura answered him-You wouldn’t believe it! V.C. will be awarding a $10 Amazon or B/N GC to a randomly drawn winner via Rafflecopter during the tour. I enjoyed the trailer, thanks for sharing! You said above you are working on a sequel to Hanami, how many books are going to be in the series? I was wondering what your ultimate career goal/dream is? Are any of the characters in the book inspired by real people in your life? Who were you rooting for yesterday, eagles or the patriots? If your book was made into a show or movie who would you like to star in it? HOw long did you have to shop your book around before it was published? What do you do to overcome writer's block? Out of the fictional characters you have created, who is your favorite and why?